The most commonly planted evergreen hedging there is. The cherry laurel (Prunus Laurocerasus) are the classic, big glossy leaved evergreen, seen everywhere. 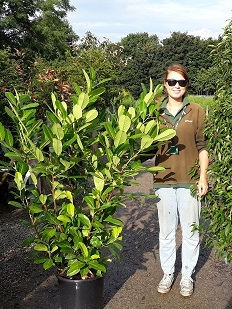 One of the biggest selling points for the Cherry Laurel is that they grow extremely fast, with about 2/3 foot of new growth each season, making this a plant to not take lightly for a quick instant hedge! If planting a hedge, you will soon find it nicely dense and tall. This plant is one of our hardier plants, the only thing that you need to keep an eye on is that they do not enjoy is sitting in waterlogged soil. If they are sitting in waterlogged soil you won’t see much of a difference in them except they may look a little bit sad and drooped. The Laurel as mentioned above is hardy meaning that for Trimming/Pruning, you could do this multiple times a year, with 2/3 foot of new growth each year it is almost necessary. March is a good time of the year to look at pruning if the plant is getting too large as being springtime it gives the plant a good chance to grow back, while trimming can be left until a bit later in the year around June-September time. While trimming your plant into shape try not to cut through the leaves as this can leave the plant looking fairly unsightly! Now, like all plants there are a few diseases that can affect them despite being such a tough cookie! Powdery Mildew, Leaf spot fungi and Bacterial Shothole, these are just the more common diseases, usually these diseases leave the plant looking like it’s been shot by a shotgun with lots of little holes in each of the leaves and irregular edges. For treatment of these diseases there are special chemicals you can spray that can defend your plant to stop infections like this happening, however once the plant has been affected there is little that can be done to "cure" it. Laurels are naturally hardy plants, meaning a little bit of pruning to remove the dead/unsightly leaves can be good and neaten your hedge, however avoid any heavy pruning as this will just place a strain on the plant and hinder its own natural ability to fight the disease. If wet soil is a problem, then perhaps consider potentially a different plant (perhaps a Portuguese Laurel or Leylandii) or you could raise the planting bed a little to keep the roots above the water level. In early Spring you catch the first few glimpses of the flower buds that are soon going to flower on this plant, the bud appears early spring and open in Summer to reveal a creamy white petalled flower. Combined with the fruit that is produced from the plant as a berry, coming in as bright red then changing to a black in early Autumn when more mature, this fruit looks extremely like the very common Cherry fruit. The plant as I have already mentioned grows at 2/3 foot per season and has an ultimate height of around 8 meters tall or in the best conditions up to 15 meters! Now that is a monster hedge and will certainly keep out unwanted eyes! But that is in the absolute perfect conditions that most average gardens may not be able to achieve. Given enough time in most soils and gardens your plant will still reach large heights, more than enough to be a great screen! If you are reading this far then you will already mostly know what you are looking to do with your Laurel hedging be it setting up a new hedge or using it as a specimen plant, however if you are going to use this as a hedge then you should know the sizes/amounts you will need. On our website beside every single one of our plants is a handy description of that plant along with a guide on roughly how many plants you will be needing for your area, it’s extremely easy for the non-gardening individual to put together a plan on making the garden green! Thank you very much for reading and if you have any questions regarding the plants on our website or any general questions regarding Laurel Hedging including diagnosing your laurels if you suspect anything is going awry, I will be glad to answer them!